This May 8, 2018 photo released by the Brazilian Environmental and Renewable Natural Resources Institute (Ibama) shows an illegally deforested area on Pirititi indigenous lands as Ibama agents inspect Roraima state in Brazil's Amazon basin. 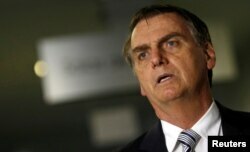 Scientists warn that Brazil's president-elect could push the Amazon rainforest past its tipping point — with severe consequences for global climate and rainfall. Next week global leaders will meet in Poland for an international climate conference to discuss how to curb climate change, and questions about Brazil's role in shaping the future of the Amazon rainforest after Bolsonaro's election loom large. New Brazilian government data show the rate of deforestation — a major factor in global warming — has already increased over the past year. FILE - Brazil's President-elect Jair Bolsonaro arrives for a meeting in Brasilia, Nov. 20, 2018. 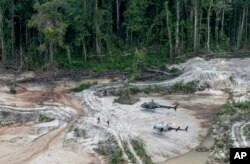 In this May 4, 2018 photo released by Ibama, the Brazilian Environmental and Renewable Natural Resources Institute, members of a specialized inspection group of Ibama walk with their weapons up through an area affected by illegal mining, after landing in helicopters in Munduruku indigenous lands in Para state in Brazil's Amazon basin. In a Nov. 1 postelection interview with Catholic TV, Bolsonaro said, "We intend to protect the environment, but without creating difficulties for our progress."